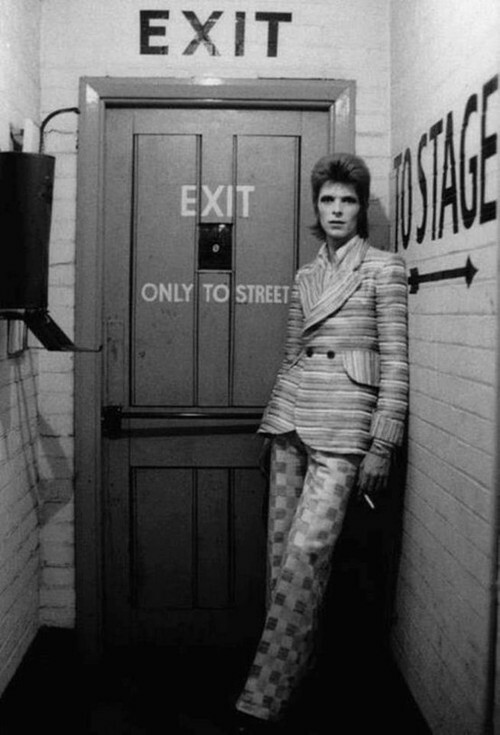 Have I mentioned I love David Bowie? I have decided that triggers are lies. This does not mean that triggers aren't real. They are real. I've spent months avoiding all things Asian, I torched every pair of Mr. Scabs underwear, I fell into the emotional equivalent of an affection-starved, mange-covered mutt at the simple sight of glazed donuts. Anything could hijack my senses, triggering. I could smell, hear, feel, see and taste Insanity. There was a time when Insanity and I were BFFs. Her hand tightly holding mine, leading me through the darkened narrow gorges of betrayal. I may have even taken a few drags from her ashy cigarette. I invited her to take over. In case you're wondering, she has a striking resemblance to David Bowie's picture above. In fact, I swear she wore those same checked pants. I felt comfort in blaming an entire race for my marital break-up, I felt the burn of hysteria when the flames rose from his pile of boxer briefs...those were good times. Necessary times. I had to feel the insanity, the crazy, the numb, the blinding anger, the overwhelming sick-pitted pain to get to the other side. "You see his belt. The dark brown leather one, the belt you bought him for Christmas a few years ago? That's the same belt he unbuckled for those hookers. He undid the silver clasp and dropped his drawers! Can you imagine their fingers on his belt? The belt you bought! Damn hookers! Damn him..."
Her voice trails off in a disgustingly graphic description of the belt and Mr. Scabs and hookers. I realize, I can't listen anymore. She is lying. In the end, the belt is just a leather belt. A genius device used to hold ones pants up. Nothing more, nothing less. At this moment a flood light blinds us shining through the narrow canyon. Squinting into the light I see a rescue chopper hovering above. Sanity (Insanity's much cooler twin sister) hangs out the side and drops a rope ladder. A rescue! I am not trapped in this cycle of self-destruction! Triggers don't have to throw me to my knees. I don't have to wallow in Insanity's friendship. Jumping for the ladder, Insanity grabs at my shoe as I'm lifted into the air. Under the whirl of the choppers blades, I look down. My shoe in her hand as she shakes it toward the sky, cursing me. Insanity doesn't like to be alone. Today you will let the pain, hurt, anger, depression enter my heart but you will not let it take over. You will acknowledge it and then you will dismiss it. You will literally dump it from your brain and heart. You will replace it with gratitude. You will walk to the refrigerator, fill your glass with ice and water, then drink it slowly as you let the negative pass and let good things fill you. You have the metal prowess of a puma. You are in charge of your thoughts. And that is the story of how I decided triggers were lies.